The San Diego-based hospital ship USNS Mercy apparently will not be deployed to help the Philippines with typhoon relief after all. 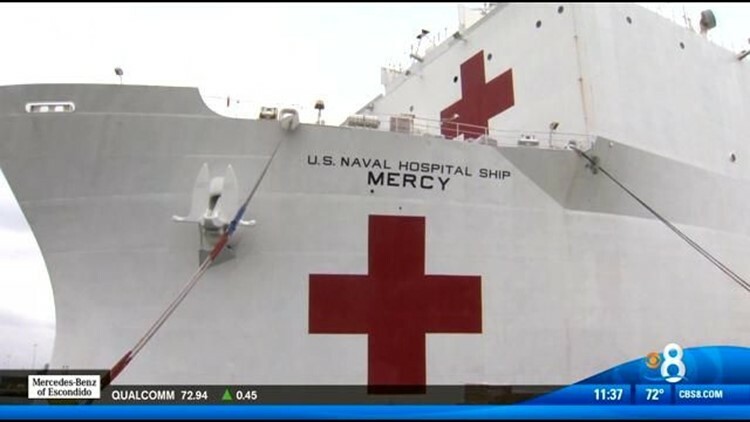 SAN DIEGO (CNS) - The San Diego-based hospital ship USNS Mercy apparently will not be deployed to help the Philippines with typhoon relief after all. The crew of the giant white vessel moored in San Diego Bay was activated five days after Typhoon Haiyan struck the central islands of Leyte and Samar Nov. 8, killing more than 5,000 people. Navy personnel were ordered to stock up supplies and prepare to ship out in a few days. However, the vessel has since been deactivated, according to the San Diego Union-Tribune, which cited the U.S. Pacific Fleet as the source of its report. Another ship based locally, the guided-missile cruiser USS Cowpens, has been operating off the Philippines for about a week. The San Diego-based littoral combat ship USS Freedom delivered supplies to the area on Sunday, Navy officials said. The Freedom had spent the past several months operating in Southeast Asia, and was expected to return to its San Diego home port following its relief mission.